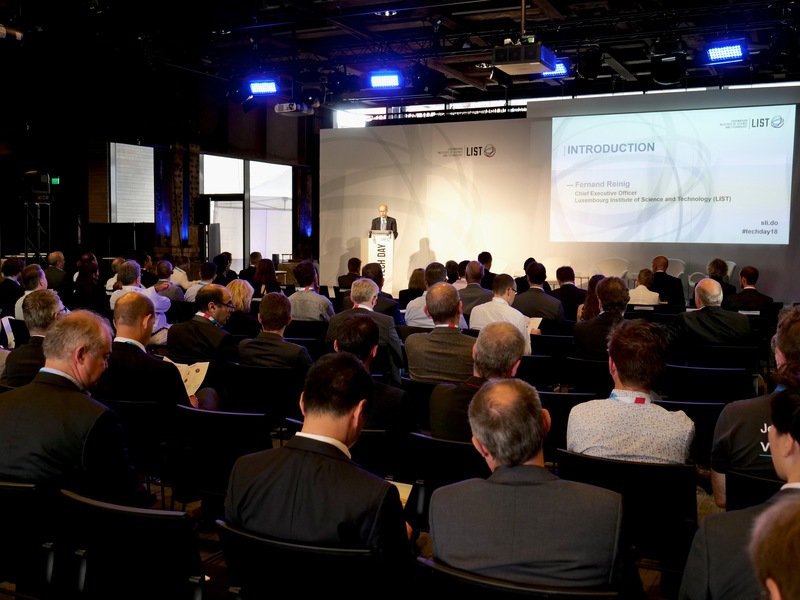 The crucial importance of collaborative research and industrial partnerships to national economic and business growth in particular was firmly emphasized at the first LIST TECHNOLOGY DAY (LIST Tech Day), organised by the Luxembourg Institute of Science and Technology. On Thursday 21 June 2018, more than 150 decision-makers, managing directors and research directors attended LIST TECHNOLOGY DAY (LIST Tech Day), devoted to innovation in Luxembourg, along with representatives of the Ministry of Research and Higher Education and the Ministry of the Economy. Organized by the Luxembourg Institute of Science and Technology (LIST), this event firstly drew participants’ attention to the advantages of a collaboration with a Research and Technology Organization (RTO), and how it works in practice. The main role of an RTO (LIST being the only one in Luxembourg) is to harness science and technology to further innovation, improve quality of life and boost economic competitiveness. Unlike conventional research bodies, such as universities, which focus on education and the development of scientific knowledge, LIST seeks to convert existing scientific knowledge into usable technologies. It is therefore vital to join forces with industrial partners interested in implementing these innovations in order to convert science into usable technologies in a practical, cost-effective and sustainable way. Numerous practical examples of collaboration between LIST and private and public partners were highlighted. From space research to nanotechnology, some fifteen manufacturers discussed their experiences with LIST researchers in activities in the strategic fields of materials and environmental research, and innovation in information technologies. In terms of materials, a number of manufacturers gave presentations, including CARLEX and Circuit Foil, with which LIST works closely. LIST is collaborating with them to, respectively, develop a new generation of windshields which reduces the ecological impact of car heating and cooling systems, and to develop a new generation of copper to construct lightning-resistant composite aircraft. In the area of environmental research, PM-International AG and LuxSpace were two of the participants to share their experiences. With these companies, LIST is working to, respectively, develop innovative bio-based supplements for health, fitness and beauty product lines, and on the development of a remote sensing-based ship detection system. Lastly, in terms of innovation in information technologies, Paul Wurth and the Institut Luxembourgeois de Régulation (ILR), the national regulatory authority for the telecommunications sector in Luxembourg, also gave presentations. While Paul Wurth calls on LIST’s expertise in Business Analytics (BA) to address the challenge of its digital transformation, often summed up by the term Industry 4.0, ILR is working with LIST on the establishment of a national regulatory platform enabling operators of telecommunications services to effectively manage and report their risk analyses in compliance with the legal requirements. This feedback gave participants not only a better understanding of the form that cooperation between LIST and their company might take, but also prompted them to consider their own innovation needs and perhaps take the plunge. LIST also used this celebration of collaborative research to sign a partnership agreement with the Luxembourg company International Lacquers Cosmetics, which makes nail varnish and cosmetic products. Together, the two future partners have committed, over a period of three years, to develop the nail varnishes of the future – long-lasting and hardwearing – as part of a research project undertaken in the framework of a public-private partnership (PPP) supported by the Ministry of the Economy. This agreement will enable the manufacturer to bolster its leading position in the global nail varnish market and to establish a distinct competitive edge over its rivals. If further evidence were needed of the benefits and crucial importance of innovating in a competitive market, it seems clear that the feedback and the range of opportunities offered by an RTO like LIST delivered a consensus. Given the success of this first edition, LIST Tech Day 2018 is but the first in a long series of events and aims to become a central forum for the advancement of collaborative research and industrial partnerships in Luxembourg.